I’ve been searching for words to express my thoughts all day. Five year’s ago today Port-au-Prince, Haiti was devastated by a 7.0 magnitude earthquake. It destroyed most of the buildings and infrastructure that had been established in one of the poorest places in the world. My heart sank as I watched the round the clock coverage of the disaster. I even thought about traveling down there with some local doctors. We worked on a way to make that possible but we decided that it was better to send someone with a skill set to help those in need than another reporter to cover it. Why did what happen in Haiti hit me so hard? Well two years before the earthquake, in January 2008, I traveled down to Louverture Cleary School to spend a week with The Haitian Project. We volunteered our time helping with projects during the day but after school we conducted soccer clinics. I know what you’re thinking: Lauren isn’t a soccer player. True. I wasn’t and I’m still not but the skills we were teaching had more to do with teamwork and empowering girls than it did the actual game. And as I learned, the universal language and common ground we all shared was soccer. The trip was only a week but it forever changed me. I still remember the people I met and the impact they had on my life. And the lessons they taught me. When the earthquake struck in 2010 some of our friends were killed. The school sustained significant damage. The structure that volunteers from Loras College and other areas worked so hard to build, had been destroyed. Life as they knew it was forever changed. But their spirit was not broken. The following years in Dubuque, Iowa, I worked with a local restaurant and bar to build a fundraising for the group. And to honor my friends and their loved ones. 1. Faith, hope and love are all you need. 2. What you receive as a gift, you must give as a gift. In a country torn apart by violence and poverty…then an earthquake…I found their spirit and faith to be so inspiring. Seven years later I still think of the days I spent there and the impact it had on my life. Sometimes when things happen a world away it’s hard to understand or even grasp. But the beauty of experiences is that we get to take them with us wherever we go. So take yours and share it. 2014 has been GREAT! Seriously, I covered so many stories; joyful, inspiring, impact filled, heartbreaking and tragic. 2014 marked another year in Memphis and a thousand reasons to continue to call it home. 2. Bible Blessing – A bible found untouched in the rubble of a fire – In November we first brought you the story of Elnora Blackledge-Lee. While away treating one of her daughters with cancer, they house caught fire. We were there as volunteers from a nearby church found a bible untouched. I captured the moment the Elnora saw the bible. Her strength was inspiring. You shared her story and prayed for her family. They are still looking for a home as I type this. 3. Memphis Police holiday ham – MPD handing out holiday hams on Thanksgiving, courtesy of Jason’s Deli. It was touching to see the interaction between police and citizens. It’s been a hard year for both. And to see the joy shared and receive while making a holiday meal possible, it fill my heart and yours. You shared and comment about this story. And with that, here’s to a GREAT 2015!!! GREAT NEWS UPDATE: Remember AJ? The homeless man I posted about a few weeks ago? The “I am blessed” man who reminded us of the importance of being grateful? Well I have a good news update for you on his status. This comes from my friend Ellen with Urban Bicycle Food Ministry, who saw him on Wednesday: “I saw AJ again last night. He hasn’t been back out since the night that we first met him when this picture was taken. Last night he walked up to me in our small group as we were stopped with some other folks. I couldn’t help but bring you this update, considering I shared the story with you in the first place. Thanks to all who kept him, and all those living on the streets, in their thoughts. 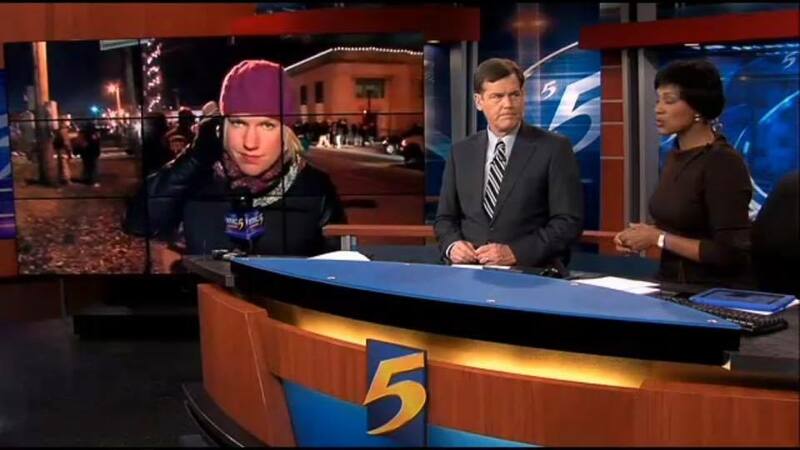 Monday night – At 5:00 pm WMC Action News 5 made the decision to send a crew to Ferguson. At the time we didn’t know whether the grand jury would indict Officer Wilson. But we knew, either way, all eyes were on the story. And people in Memphis would have something to say about it. 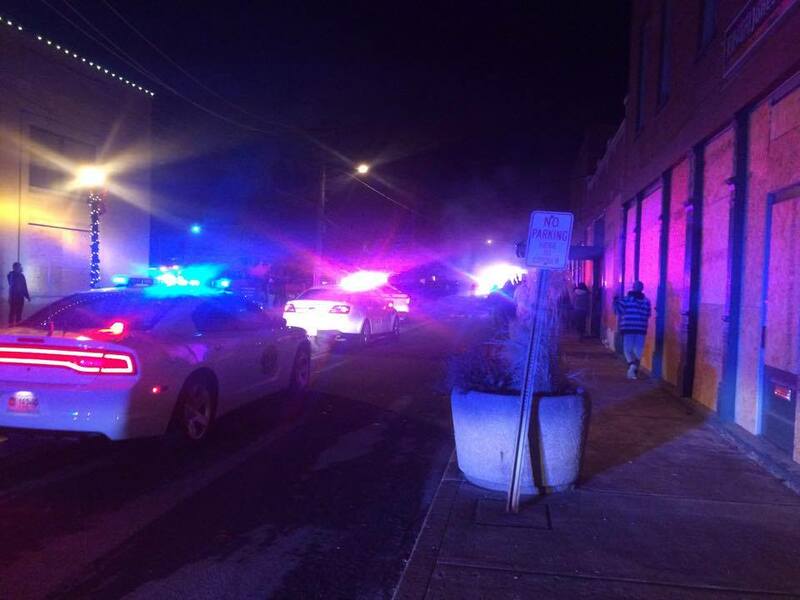 We knew it mattered to our viewers in Memphis, they too had planned a protest, regardless of the outcome. The announcement came at 8:00 pm. I watched it all unfold on CNN. And for the next three hours I watched reporters in the crowd get tear gas, rocks, and bottles thrown at them. 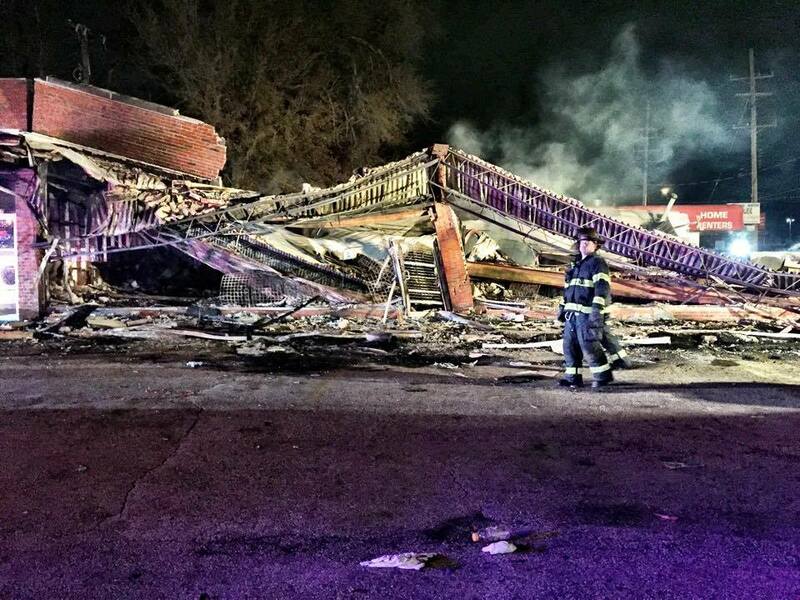 While other rioters and looters destroyed businesses along W. Florrissant and S. Florrissant. On TV it looked like total chaos and I had not idea what I was getting myself into. 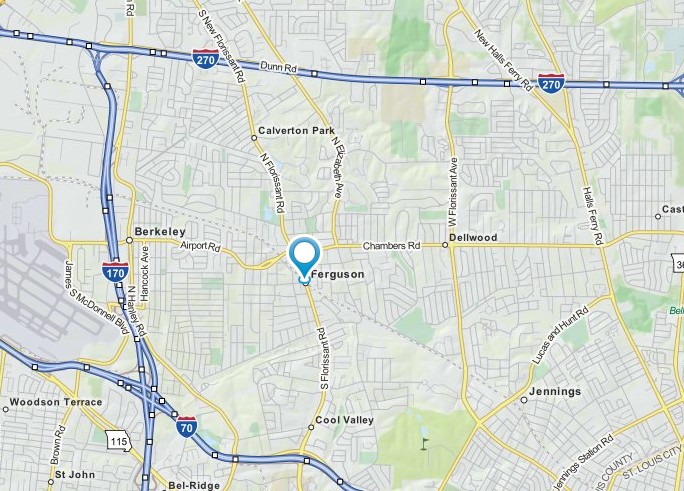 Map of Ferguson – note W. and S. Florrissant about a mile apart. At 11:00 pm we loaded our WMC Action News 5 car with camera gear, laptops, chargers and our LiveU Backpack (oh and an overnight bag). 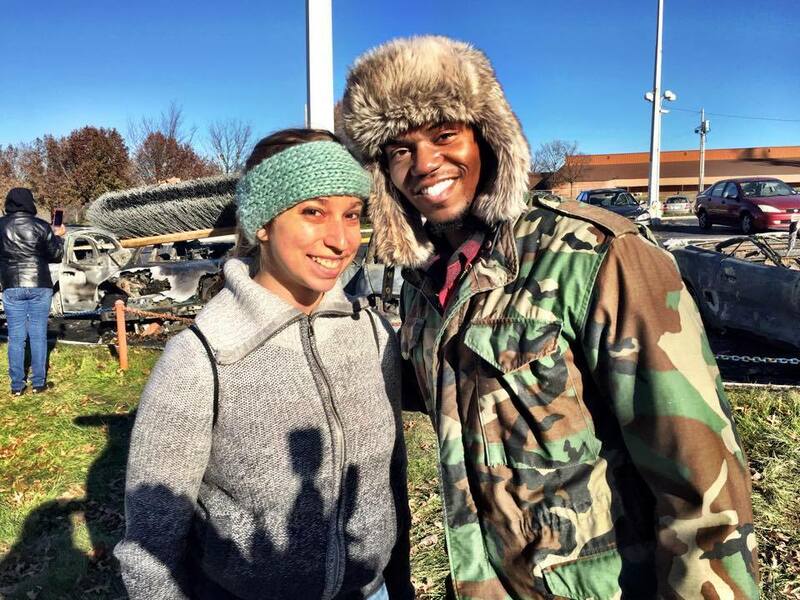 We hit the road for Ferguson, not knowing what we’d encounter. 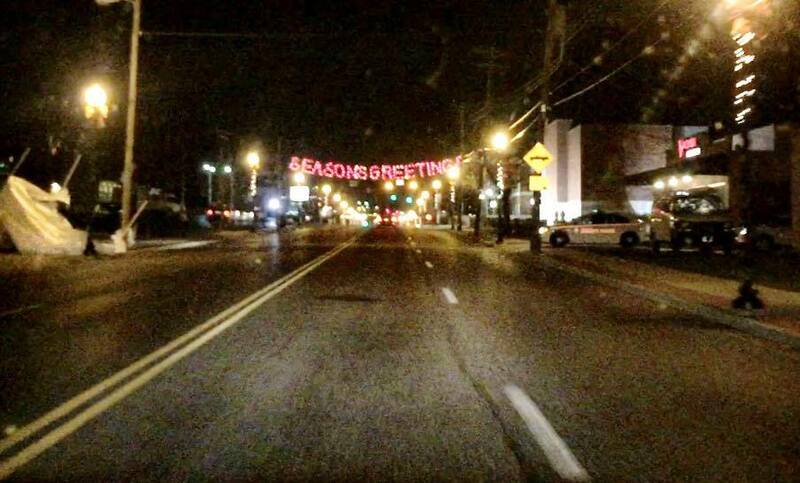 At about 4:05 am we arrived in Ferguson, greeted by that now famous “Seasons Greetings” sign outside the Ferguson Police Department. We kept driving and saw the damage done to local businesses. 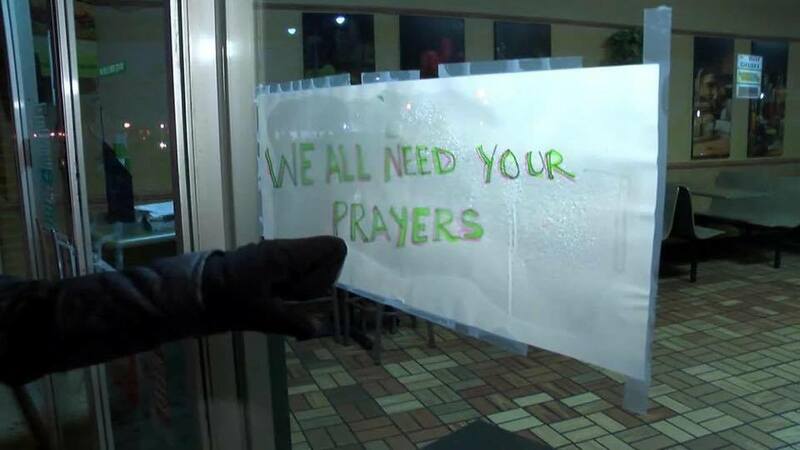 Glass was everywhere, broken out windows, looted stores and numerous police cars driving around. We stopped at the scene of a fire for our first live shot. It was then, that I got my first glimpse of the true destruction and devastation. It was a Little Caesars pizza, next to business I could not identify because it was destroyed. The place the a total loss. Fire crews were still on scene. In all, 13 buildings were destroyed in large part because crews couldn’t fight the fires safely. While they were responding to fire calls, gun shots were being fired into the sky. It was so unsafe many of the crews abandoned their fire hoses and left. We did live shots all morning, about four an hour. But what I didn’t realize is it was only the beginning of a look at life in Ferguson. It was hard to think that all this damage was done so quickly and how much it will change life for so many in Ferguson and surrounding communities. After our morning live shots, we were give the “all clear” to find a hotel and take a quick nap before we prepared stories for evening newscasts. I couldn’t really sleep, because all I could think about was how people would be waking up today to a community forever changed. As the sun came up, the damage became clear. The smoke from buildings billowed over the community. It was most certainly imagery for the a much bigger issue going on in Ferguson. To give you context, the community has a population of 21,000 people. That’s about twice the size of Millington, TN. Most of the damage was isolated to two main streets. But that damage contained the majority of major local businesses and shopping resources in the community. That damage also spread into the neighboring community of Dellwood. Most of Tuesday was peaceful. 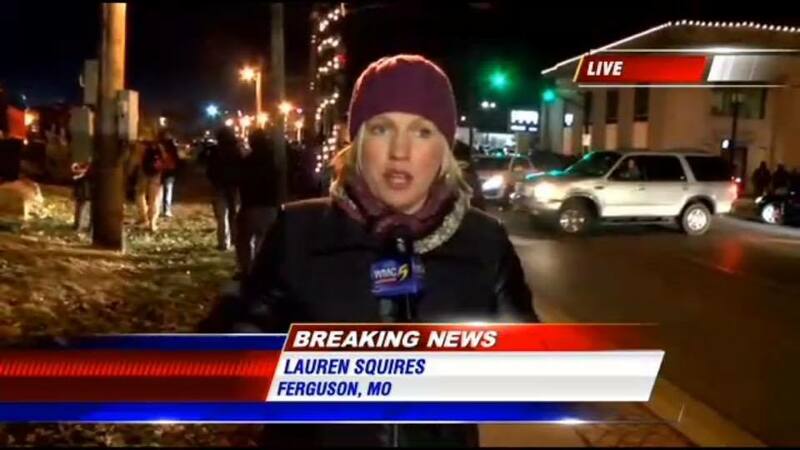 Media outlets from across the country descended on Ferguson. Many of them had been there in advance of the announcement, preparing for whatever happened. We all had stories to tell and we were all trying to give people a glimpse of what it was like at our location. That’s the thing though, it was different, depending on your perspective. Near the Ferguson Police Department, City Hall and the Library (where the protests started) it didn’t look as bad as it did over on S. Florissant. And in the middle of those two streets, sat homes untouched, churches with their doors open for prayer and people just trying to live their lives. Trying to comprehend what happened to the community they call home. If you know me, you know I look for the positive in every situation. In this case, I was determined to show that the human spirit had not been defeated, despite they way it looked. I found volunteers from across the city and St. Louis area, coming together to clean-up. Bringing food and water to those who were stuck out in it all day. They wanted to be a voice of reason amidst so many unanswered questions and raw emotions. As for me and my photographer – all day long I got getting messages from people who were praying for us. I asked all of them to pray for the community too. It’s a powerful prayer and I know it’s been prayed by many who know we are here. I refused to let anything get in the way to telling the story of history unfolding from our perspective. I refused to instill fear in people and not show them what was happening on all sides of the story. We did our evening live shots from the corner of S. Florissant and Chambers. At that point, when the sun started setting, the tensions started to grow. People were passing by and honking. Shouting profanities at the media, walking by wearing masks and helmets. They seemed to be prepared for a possible riot or smoke bombs from police. National guard members arrived in HMMWV’s as thousands of them were deployed to prevent what happened Monday night. We watched a few peaceful protests unfold at our intersection. Protesters had their hands up and said “Hands Up. Don’t Shoot” over and over again. As police arrived in riot gear, the crowd got heated and started to spill onto the street. The national guard asked the media to clear out of the Walgreens parking lot and find somewhere else to go. So at 9:00 pm we headed back over to the Ferguson Police Department. All night, there had been a relatively calm protest. Only a few arrests, smoke bombs and bottles thrown. NOTHING compared to Monday. She was right…none of us knew what to expect. At 9:54 the crowd started moving down Florissant, towards City Hall. We were set up to go LIVE with our mobile backpack. So we walked along the street with protesters, prepared to report on the PEACEFUL protest turned march down W. Florissant. As I looked up I saw smoke and flames. Hundreds of people were running towards it. All the while, 20 plus squad cars were responding. Sirens were loud, people were throwing rocks, bottles and whatever else. The ONE photo I took during the chaos. We ran across the street and stood near a bus stop and went LIVE in the chaos by accident because it happened so fast. I repeated “we are safe.” Over and over again. My voice even cracked in air when I realized we were safe. At that moment I said a quick (like really quick) prayer for safety and found peace and calmness overcome me. I finished that live shot and took a deep breath. Part of me thinks I was really trying to reassure my family watching back in Memphis that I was okay…the other part of me thinks I had no idea what else to say. A few minutes later police fired smoke bombs into the crowd. That made things calm down. We did a second live shot. This time much more calm. Shortly after that we got wind, literally, of the smoke bombs and started coughing. It was a very intense 30 minutes. People asked me if it felt like a “war zone.” I can’t truly answer that because I’ve never been in an actual war zone. But, I can say that if I were to imagine what that might feel like, for a few moments, it felt like that. (you can watch ALL the LIVE shots here). But we got to leave. We got to head back to a warm hotel. Ferguson stayed up late, police tried to get the crowds under control. And the national guard members stood guard for HOURS after that. As I sat back in the hotel room, I was reminded how quickly something calm can become chaotic. And how quickly a few bad decision can turn a crowd. I was honored and humbled to cover this moment in history. People were messaging me calling my reports “courageous” and “brave” but I think the true people who are courageous and brave are the ones who will remain in Ferguson. The ones who will work to rebuild it. The ones who will start tough conversations about race and policing. The ones who will truly begin to make change in a community that’s lost so much more than we can ever imagine. No matter where you fall on the opinion scale, there is a community of people (on both sides of the issue) hurting by what happened there back in August and November. “I am blessed,” said AJ as we handed him two burritos and a water bottle. AJ is a homeless man who fell on hard times. Moved back to Memphis to care for his ill parents and when they passed, he wasn’t able to find a job. He is currently looking for work (hotel or restaurant industry) and has an attitude about life that we could all learn from. AJ – the first man we met Wednesday. as 32 degrees when I left my condo and rode down to the church. By the time I arrived at First United Methodist on 2nd Street, I could barely feel my hands and my feet were feeling the cold. It was only the beginning. 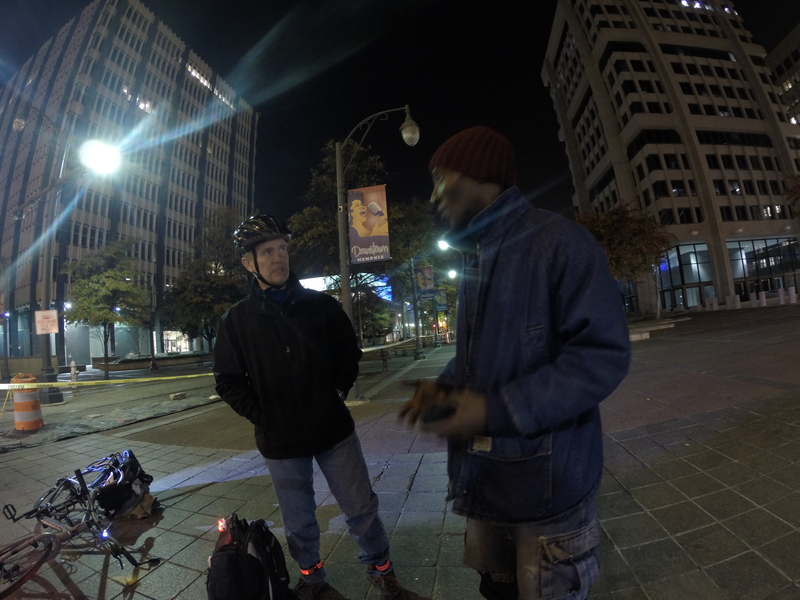 UBFM is one of my favorite ministries in the city of Memphis because I get to know the people who live on the streets of Memphis; my homeless friends. Each Wednesday night the group gathers at the church. They make burritos and care packages and head out on three or four different routes. Each route touches key parts of downtown and midtown; giving food and fellowship to anyone in need. I love meeting people, asking their names, looking them in the eye and giving them a moment of my time. Truth is, they give me their time too and we both walk away smiling. AJ, who we met not far from the church, was the first recipient of our food Wednesday night but there were so many others. 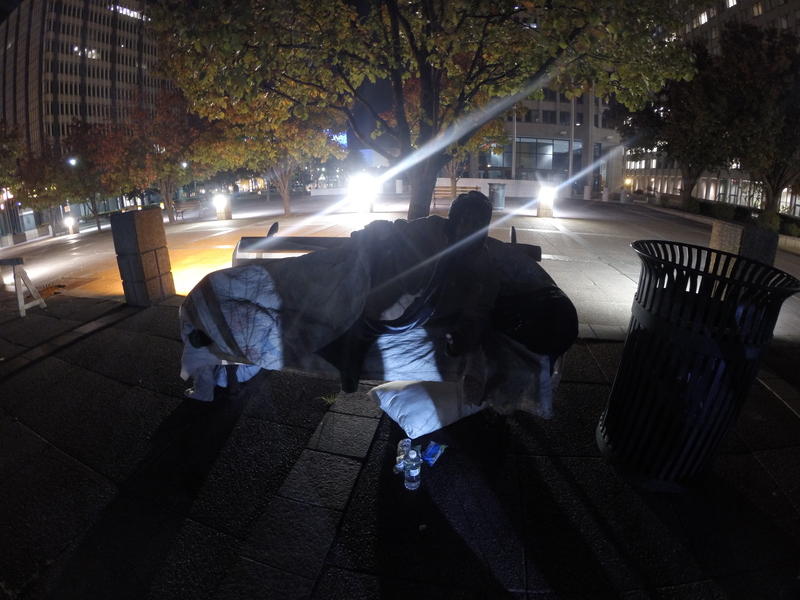 People who were spending the night on the streets, using what they had to stay warm. It was the coldest night of the year the far and by the end of our adventures, my feet were num and my nose was frozen. Lucky for me, I could ride my bike home to a warm place, change into a warm outfit and sleep in my warm bed. This morning when I woke up to frost on the ground, ice on the roads, I couldn’t help but think of them. I got dressed for work, bundled up for the coverage and saw how the unexpected precipitation overnight impacted the morning commute. But I can’t imagine what it felt like for those people who had to wake up outside and in the cold. UBFM rides every Wednesday at 7:30 pm and Saturday mornings at 8:00 am. Volunteers gather at First United Methodist Church (204 N. Second St. in downtown Memphis). The need is great and the power of a moment is even greater. I witnessed a powerful moment in the halls of juvenile court today. It’s a place where cameras aren’t allowed. So I wanted to share it with you in writing. I sat in on a trial this afternoon for the 10th teen charged in the Kroger attacks. I heard the 17-year-old victim speak about what happened to him that night, how he has nightmares when he thinks about having pumpkins the size of soccer balls thrown at this head. Then I heard the teen suspect’s mother take the stand. She told the judge that she didn’t raise her son this way. And that he deserved punishment. But she didn’t want to see him be thrown under the bus. Then the 16-year-old suspect took the stand. He admitted to kicking the victim to the ground. And said that he kicked him in the head because others were doing it and he was trying to impress girls. Then the judge found him guilty of aggravated assault and turned him over to DCS for rehabilitation. After all that you would think emotions would be high. As we all walked out of the courtroom the victims father, Mark Sauser, was stopped the two mothers. They were in tears, saying that they are sorry for what their boys did to his son. That had their son been attacked they would be very upset. “I tell him I forgive him,” Mark said. At this point I was holding back tears. It’s been a rough couple of months in Memphis. Fights, attacks and people saying horrible things on social media. When you cover the good and the bad in Memphis, it’s hard not to get a little emotionally invested. Mark Sauser’s words, spoken in the hallway of juvenile court, may be the most powerful words I’ve heard in awhile. Something to think about as we move forward from the Kroger attacks and remember there is so much more good in this city than bad. Very little of what happens in my daily job ends up on TV or in any of my reports. It’s sad sometimes because the people I meet, the conversations I have, and smiles I share are, on some days, more telling than the stories I tell. Last week, while visiting the Carpenter Art Garden in Binghamton, I met a young boy named James. He was holding a pair of drumsticks that he had decorated with blue tape. “Are you a drummer?” I asked. “No. I play the snare.” He said. Then I asked him all about being a drummer. The seemingly shy kid suddenly came to life when I asked him about it. He said he used to play in the band at school before the program was cut. All he had was a pair of drumsticks but no way to practice. He answered question after question. Did he know traditional or standard technique? His favorite beats? Did plan to keep playing? Then the organizers of the Garden asked him to show off his art work. You see, James is talented. 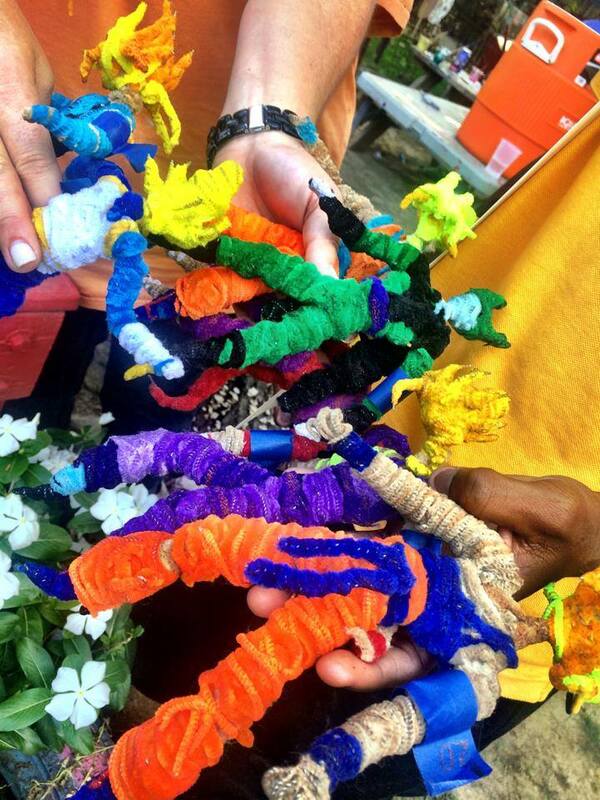 He took something as simple as pipe cleaners and produced art. 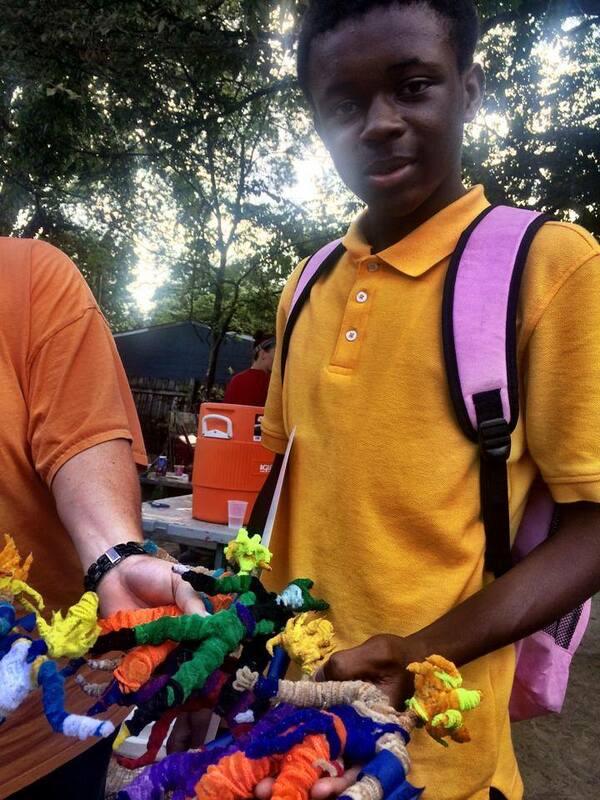 He creates them at the garden and then sells them to help raise money to keep it going. After James left, I learned even more about him. When he first came to the garden he didn’t talk. His response to a question was barely a mumble. He wasn’t social and he didn’t fit in. But then he discovered his artistic abilities. And loves it. Over time he’s become one of the most social kids and is constantly creating something. I left the garden and couldn’t help but think about how he might use a drum practice pad. You know, the kind that allow you to play without annoying everyone but also rock out for some real practice without setting up a drum. This weekend Scott and I went to Memphis Drum Shop in Cooper Young and got James a drum pad and new sticks. Tuesday, with an intern shadowing me, I asked my photographer to stop by the Garden for a few minutes. I told our intern that this has nothing to do with our story but that it was important to me. And as long as it didn’t impact my assignment, I needed to get it done. I took the drum pad out of the box and then showed him some of my (rusty) beats. James was very excited, for a shy introvert. Though he wasn’t quite sure how to react, the smile on his face said it all. James took to the drum pad. He did it over and over again. Each time bouncing the sticks higher and higher. I wanted to take a picture but I knew if I took out my camera is would ruin the moment. Instead, I just enjoyed it. His excitement grew. I have a feeling he won’t stop playing tonight until someone says it’s time for bed. This short moment out of my day reminded me what really matters. And, hopefully taught my intern one of the greatest lessons she’ll learn on this internship. Most of the time, what happens off camera is the real inspiration for who you are on camera.